Unit constructed of 16/430, 16/304, or 14/304 stainless steel. Front rolled edge with 1-1/2" upturn on rear and ends. Stainless steel wall brackets are shipped loose for mounting directly to wall studs. Brackets can be mounted to studs—no wall backing required. 1-1/2" (38mm) upturn on rear and ends of shelf. 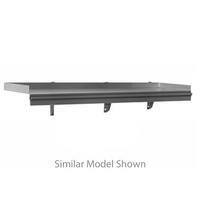 Models available with 1-1/2" (38mm) rolled front edge or 1-3/4" (45mm) “V” marine edge on shelf. 12" and 15" (305 and 381mm) widths available. Lengths available range from 24? to 72? (610 to 1829mm).